I had such high expectations for this book! 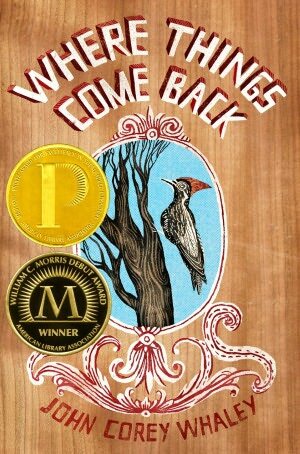 To have earned both the Printz Award (best Young Adult book for readers age 12-18), and the Morris Award (best debut fiction), is a pretty impressive literary feat. 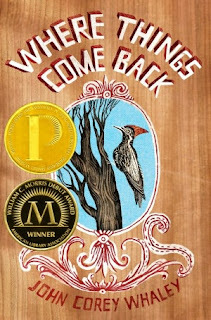 Where Things Come Back by John Corey Whaley brings to life a small, but dull town in Arkansas, where Cullen Witter is about to begin his senior year of High School. The book opens with Cullen identifying his dead cousin's body in the morgue, and it gets progressively stranger from there! We are introduced to a cast of characters that reside within the town of Lily, Arkansas, including a girl who manages to kill her boyfriends (not directly - they die after dating her), a reappearance of the "Lazarus" woodpecker, and the people who "flock" to discover it, and a teenage missionary from Atlanta named Benton Sage. The book spins two separate tales, that converge in a bizarre climax. It is a very unusual book, and contains a lot of mature themes, including sexual content and language. I still am not quite sure what to make of it, and I can't say that is a good thing! I don't want to say too much about the plot to spoil it for anyone about to read it. It was not my cup of tea, but a lot of people loved this book. 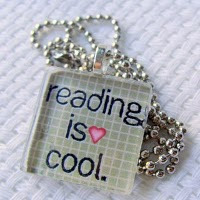 Read it, and see what you think!